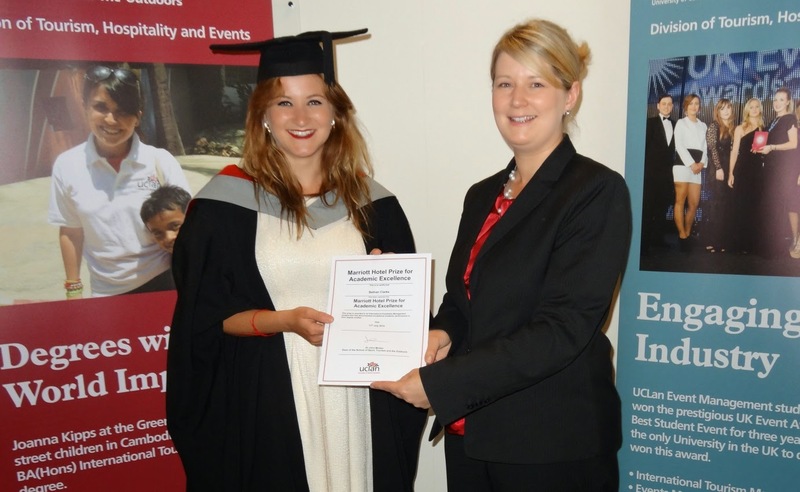 In addition to graduating with First Class Honours in International Hospitality Management, Bethan Clarke was also awarded the Marriott Hotel Prize for Academic Excellence. We spoke to Bethan about her decision to come to UCLan and her University experience: "After taking an online personality quiz and being inspired by the TV series 'Hotel Babylon', I decided to plunge into four years' worth of debt by enrolling at UCLan – it was a great decision! "The placement year within the degree was an attractive aspect when choosing a course/university, and resulted with a year in Chicago working in a Marriott hotel. Taking part in a role rotation there (mostly Front Desk) I gained great work experience and thoroughly enjoyed both work and leisure aspects of the placement, enabling me to return to Preston with solid career goals and the drive to succeed in my degree. "My final year brought once in a lifetime field trips to Poland and Cambodia and, thanks to my tutors at UCLan, also a great end result. I'm thoroughly grateful for the help and support I've received throughout my time at UCLan and the remarkable experiences and opportunities which have been offered to me."